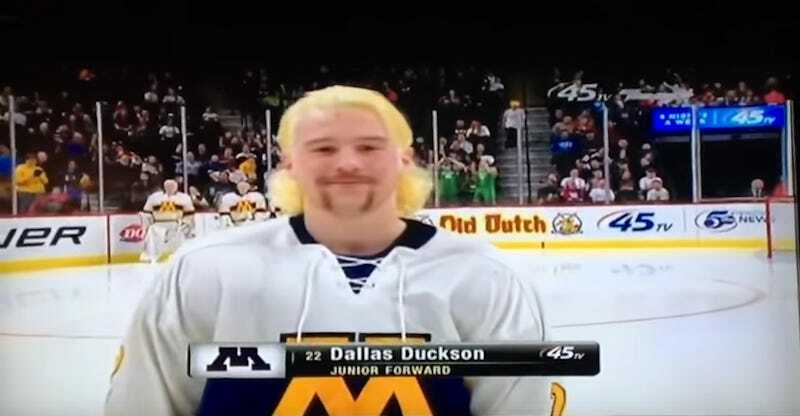 This may come as a surprise, but Mahtomedi High School’s (Minn.) Dallas Duckson, the kid with a flow brighter than romaine lettuce, wasn’t even in the top five of the 2017 All Hockey Hair Team. John King, the judge of this roster, appears to prize the natural over the chemically enhanced. Despite Duckson’s low ranking, the list doesn’t disappoint. Without giving away the entire look of this year’s No. 1, his name is Reagan Garden, and his mane is awe-inspiring.